SHE NEVER GOES 40 MINUTES WITHOUT THE FIZZY DRINK, AND MISSING A HIT CAUSES HER TERRIBLE HEADACHES AND MOOD SWINGS. – SHE NEVER HAS LESS THAN 6 LITRES IN THE HOUSE. – SHE GOES ON THE SCHOOL RUN WITH BOTTLES STUFFED IN HER CHILD’S PUSHCHAIR. – SLEEPS WITH A PINT BY HER BEDSIDE SO SHE CAN GUZZLE DOWN COKE BEFORE SHE GOES TO SLEEP AND AS SOON AS SHE WAKES UP. Reaching into the fridge Jakki, 42, clasps her shaking her hand around a cold bottle of Diet Coke. It has been just forty minutes since her last pint of the fizzy stuff. Jakki swigs EIGHT LITRES of Coke every day and suffers from extreme headaches and mood swings if she misses a fix. 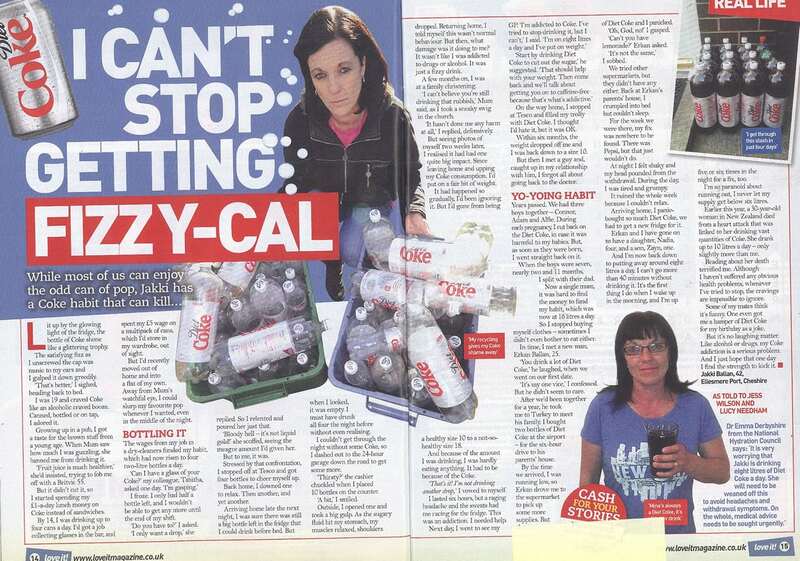 At her worst Jakki was swigging 16 LITRES of full-fat cola a day and ballooned to a size 18. She said: “I was brought up in a pub and throughout my childhood I was surrounded by a never ending supply of Coca-Cola. “But my parents refused to let me drink it so I used to imagine how lovely it would taste. “We were only allowed it as a very special treat but when I was old enough to have pocket money it was spent on Coke. “When I got my first job the first months wages went straight on fizzy pop and all the other wages after were spent in the same way. I couldn’t get enough. Friends and family began to comment that Jakki was never seen without a coke in hand. But after tipping the scales at 18 stone and unable to control her expanding waist band Jakki knew it was time to see her GP. But to Jakki’s horror she became even more dependent on the low calorie cola and her addiction spiralled out of control. “Forty minutes is the absolute limit of how long I can go without it. “The cupboard are bursting with the stuff and if my supplies ever fall to six litres I start to panic. Jakki reached breaking point when her four-year-old daughter questioned her addictive behaviour. Overdosing on caffeine causes Jakki stomach cramps, shakes and sleepless nights. She said: “I wake up about five or six times a night so I always take a pint of Diet Coke up to bed with me. “That way a sip of coke is the last thing I have at night and the first thing I wake up to in the morning. DO YOU HAVE ANY FUNNY, BIZARRE OR DANGEROUS ADDICTIONS? TELL US ABOUT THEM BY USING OUR CONTACT FORM ON THIS PAGE, OR CALL OUR HOTLINE. WE PAY FOR YOUR STORIES. Read more about how to sell your story here.